The Israeli Emergency Bandage is something of a standard in "the industry", everybody knows it. These are pretty much the best tactical first aid dressings in the world, easy to use and extremely effective. 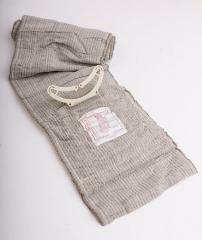 FCP-01: 4" (10 cm) wide bandage with one wound pad. Gauze roll length 4,5 m.
FCP-02: 6" (15 cm) wide bandage with one wound pad. Gauze roll length 4,5 m.
FCP-T3: 4" (10 cm) wide bandage with one fold-out/rip-off wound pad. Gauze roll length 3,5 m. Also included is an extra 10 x 75 cm roll of gauze, this coupled with the fold-out/rip-off wound pad makes the T3 extremely versatile. 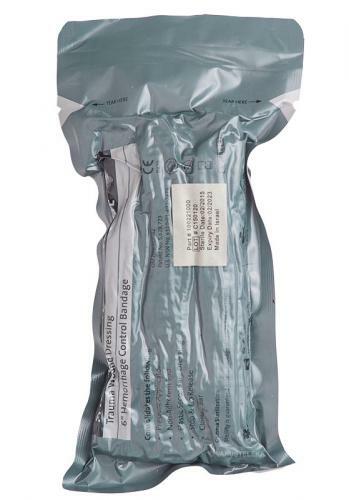 First Care Products have long been the leading manufacturers of tactical military first aid bandages. Their revolutionary pressure bar is what makes all the difference, a design that many have tried to imitate but which none has yet surpassed. Yksinkertainen, hyvä, edullinen. Kulkee aina kotona, autossa ja harrastuksissa. Tuote joka pitäisi löytyä jokaiselta kansalaiselta. Helppo käyttää ja toimii hyvin, pakkausmuovit aukeaa myös helposti.